Here is a project sent to us by a customer. 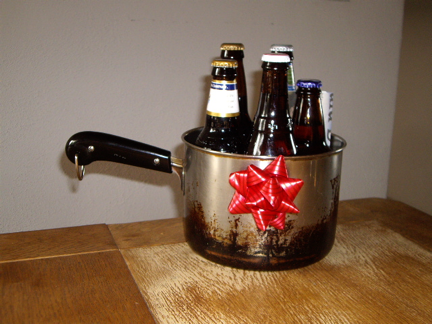 He was determined to fix a friends favorite sauce pan that had been without a handle for 20 years. 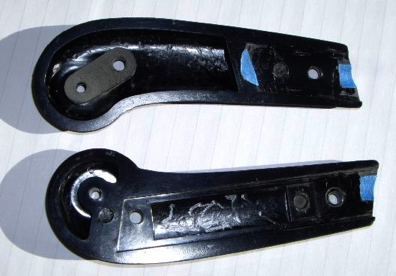 The problem was not only that the particular style of handle (the type used in the first few years of production) was not available, but that most of the metal that the handle attaches to had broken off. This just goes to show that perhaps NO piece of cookware is beyond repair to the truly determined. We have documented a simple if imperfect adaptation of the vintage style handle we DO sell to the early production pans, but for those looking for a better solution, this project should be inspiration; it is clearly possible to modify the spline that the handle attaches to to fit the “newer” vintage style handles we DO sell. Thanks to Jim for documenting this project and sending it to us. 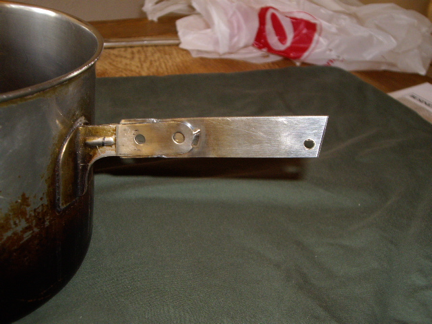 This project involved putting a “Large” sauce pan handle on a “broken” handle stub of an early model Revere Ware 7” sauce pan. 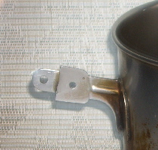 Before: This “early” model sauce pan had a broken handle bracket. After: Welding approx. 3” of ¾” x.065” stainless steel strip to the handle . Note: The original -early model- right tab was wider than ¾” and had to be ground away to match the ¾” wide stainless strip added to fit the ¾” wide handle niches. Note: The dimensional detail of the added piece was accomplished by creating a piece of light cardboard that fit the handle recesses and then transferring that to a thing piece of sheet metal and from that, it was transferred to the stainless piece for the handle. .
Left Side A. The Left Side tab was basically unchanged. 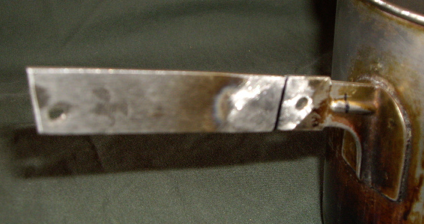 However, we did weld the left tab to the new handle material for the purpose of strengthening the entire handle system. Left Side B. Blue Tape indicates the area of bakelight removal in the handle halves. Also the left side handle had to be relieved ( notice the semi-circle of blue tape ) and some of the handle cut away where the Tab was welded to the new handle material. The right side tab of the handle required the Tab be ground away so it was only ¾” wide to match both the new handle extension width and the bakelite handle niche. Also bakelite had to be removed at the front of the handle where the strengthening rib interfered with the handle fitting flush to the tab. This piece of .040” thick x ¾” wide thick sheet metal was cut to fit the handle and used as a pattern for the shearing of the stainless piece that was .065″. The project was not all that involved and went quite smoothly. Sheet metal snips, Dremel tool, bench grinder, files, dial calipers, vice and drill were the home shop tools involved. I did take the stainless strip to a metal shop for shearing and welding. I have a pan from the 70’s. The handle came off off the pan. The pins didn”t break off. It just came apart. Can you weld it or put it back on? We are a retail operation only; we don’t do any type of repairs. You can try Classic Kitchens & More which does some types of repairs.